Egypt was the birth place of medicine, perfumes, and pharmaceuticals thousands of years ago. A look back through time shows that ancient civilizations well understood the aromatic use of essential oils for health enhancement. As long as 6,000 years ago, Egyptians discovered the therapeutic benefits of massaging with essential oils and were famous for their skin care formulas and cosmetics. Fragrances, herb oils, balsams, and resins were used in embalming techniques and religious ceremonies. The famed Balm of Gilead mentioned in the Bible was basically a resin from the balsam tree located on Mount Gilead in the Middle East. It was well known for its healing properties. Frankincense and myrrh were also used for healing. These oils used throughout history in ancient times were most likely not true essential oils but gums and resins, or oils and fats saturated with fragrant blossoms or plant material. These were not as powerful as a true essential oil but worked great for those in ancient times and shows how early on healers recognized the power of fragrance in healing. The use of aromatics spread throughout history from Egypt to Israel, Greece, Rome, and the entire Mediterranean world. Every culture developed practices of perfumery using oils, but with the Dark Ages, much of this knowledge was lost. A look at history shows that India is the only place in the world where this tradition was never lost. Ayurvedic (life-knowledge) medicine is the oldest form of medical practice using oils and has been in continuous use since its inception thousands of years ago. Essential oils arrived in Europe from these ancient countries via the Crusaders. They brought back the basic knowledge of essential oil production. The Europeans applied this knowledge to their native plants, such as lavender, rosemary, and thyme. These oils however, were not available to the average person, because they were so expensive. History shows that most of the people used herbal medicine as it was more readily available. The more well-to-do households were basically the only ones who had access to essential oils as well as imported medicines. History shows us that the advent of modern science in the 17th and 18th centuries marked the decline of most forms of herbal therapy. History shows us that physicians fell in love with the powerful chemical medicines, initiated with the growing problems of diseases. An example was syphilis, for which they prescribed mercury. However, mercury is a poison and had devastating side-effects, but it did cure syphilis. Throughout history some households and traditional healers continued to use their natural methods but more and more people turned to chemical medicines. There were still some research going on about natural remedies, for example chemist Friedrich Hoffman who research essential oils extensively, but for the most part, modern medicine moved away from the natural remedies and into the chemicals. The trend was to take medical practice out of the hands of ordinary people and put it in to the realm of specialists with their chemical medicines. With the powerful influence of science during the Age of Enlightenment researchers in the medical field became interested in the active principles of natural medicine, as well as their synthetic substitutes, instead of using the whole herbs and essential oils. Essential oils came to be mostly considered important as ingredients in fine perfumes and colognes. But fortunately, in 1928, right at a time when people were beginning to see some limits to chemical medicine and starting to search for natural remedies that worked, a French cosmetic chemist named Rene-Maurice Gattefosse (Ga-fo-say) was working in his family's perfume business and severely burned himself in an accident. He had third-degree burns covering his hand and forearm, and thrust his arm into the nearest vat of cold liquid to relieve the pain. The liquid was lavender oil. He was surprised to find his pain lessened and there was no redness, inflammation, or blistering. He realized that the lavender oil had begun to heal the burn and continued to use it. The burn healed without a trace of a scar. 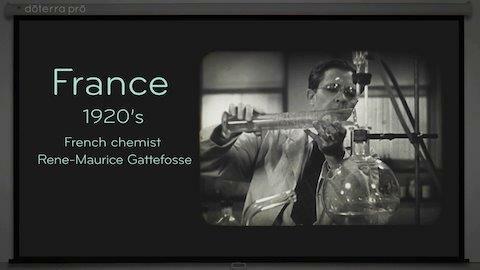 For Dr. Gattefosse, this began a lifetime of discovery for him learning about essential oils. He started with an analysis of lavender oil and continued analyzing many other oils from various plants and parts of plants. He learned that the healing properties of plants originated in their essential oils. In 1937 he published a book about the anti-microbial effects of the oils, and published many others works over his lifetime. By studying this history we find how he coined the term "aromatherapy" and experimented throughout his life with therapeutic uses of oils. Much of his experimentation took place in military hospitals, where his results with essential oils were better then the conventional medicines of the time. This was the beginning of modern day aromatherapy. Others followed Gattefosse on the path of rediscovery with essential oils. A study of history after World War II introduces us to a colleague of Dr. Gattefosse, Dr. Jean Valnet, who was a medical doctor, began his own research on the properties of essential oils during the years after World War I, also working in military hospitals and elsewhere. He was a medical physician in the French Army during World War II, treating all kinds of injuries. There was a shortage of supplies and the standard medicines ran out, including antibiotics. He tried essential oils, the wounds healed rapidly and infection was reduced and often completely arrested. Many soldiers were saved because of his treatment with essential oils. Dr. Jean Valnet has written extensively about essential oil therapy and in 1964 published The Art of Aromatherapy and the movement in Europe had rebirth. Around the same time a Frenchman, Albert Couvreur, published a book on the medicinal uses of essential oils and Madame Marguerite Maury , a French biochemist, developed a unique method of applying essential oils to the skin with massage and established the first aromatherapy clinics in Paris, Great Britain, and Switzerland, and studied the rejuvenating properties of essential oils. Her research was published in English as The Secret of Life and Youth (1964). Micheline Arcier studied and worked with Maury and Valnet and their combined techniques created a form of aromatherapy that is now used around the world. Other French medical doctors highly skilled in therapeutic essential oils as well as other therapies, followed Gattefosse and Valnet. Jean-Claude Lapraz, a medical doctor, was another pioneer in aromatherapy. He created a curriculum for natural healing, Clinical Phytotherapy, which is taught in Europe as well as other places. He taught phytotherapy worldwide to doctors and researched and published a great deal on essential oils. Renato Caryola and Giovanni Garri both Italian researchers and medical doctors conducted research on essential oils and the nervous system in 1922, including its effects on blood pressure, breathing frequency, and blood circulation rate and studied essential oils’ antibiotic activity. Another Italian researcher at the University of Milan, Paolo Rovesti, studied the psychological effects of essential oils for depression, hysteria and anxiety. Other Italian researchers, Maruzzella and Sicurella, pointed out as early as 1887 that essential oils were proven to be effective against anthrax. The U.S. Military requires all soldiers to be vaccinated against anthrax (with experimental vaccine) in case of biological warfare. A great deal of modern research has established indisputably that essential oils are antibacterial, antiviral, and antifungal. Today, thousands practice aromatherapy in France, Russia, England, the Ukraine, and many other countries. Most people don’t know how essential oils found their way to the United States, but if we look at the history of aromatherapy we find A third-generation natural healer from Switzerland, Anne Marie Buhler, who years ago had begun a business creating health-oriented products. While visiting her homeland she took a side trip to France, looking for food grade essential oils. She was referred to a medical doctor who introduced her to Dr. Lapraz and Dr. Durrafourd, medical practitioners with essential oils. They were also the President and Secretary General of the French Phyto-Therapy and Aromatherapy Association. She received her extensive training through them and founded the Phyto-Aromatherapy Institute in the United States to further accurate information about essential oils. As we all search for good health, and look back at history we seem to have come back to the beginning of a circle. Our ancestors gathered medicinal plants and herbs to create home remedies for all kinds of illness. Then with scientific advancements and the introduction of all sorts of chemical drugs we started placing our well-being in the hands of the medical establishment. With a pill or drug of some sort for almost any ailments (along with all the side affects). We try to repair our bodies when they are broken instead of keeping them from braking in the first place. As a result we lost touch with ourselves and with nature and what can really help us maintain our health and well-being (mentally and physically. Our bodies can do a pretty good job at preventing illness and disease if we take care of it and give it what it needs and can use to keep healthy. Our bodies were not made to process chemicals (the reason for all the side affects with drugs), but they can use these same chemicals in natural form (from plants not synthetic copies) to keep us going without the side effects. This poem kind of says it all, we've been traveled in a big circle, now we're back at the beginning.